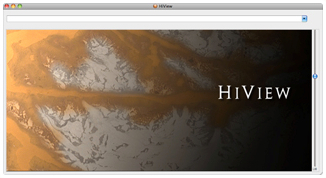 Whether you are just interested in exploring HiRISE images, or a scientist wanting to get valuable information from an observation, HiView is a versatile and powerful application. 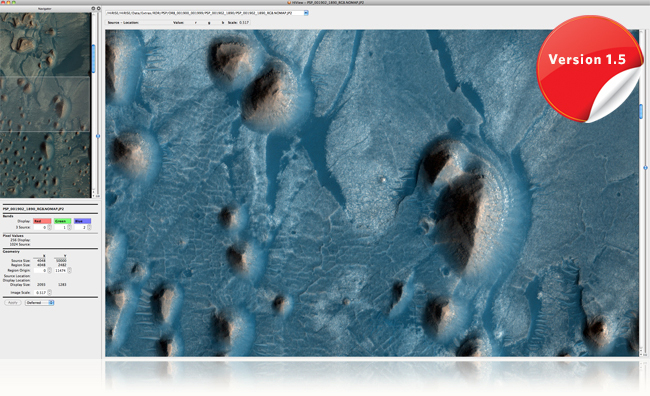 It is the ideal tool for exploring the imagery produced by HiRISE. HiView provides dynamically generated statistics about the current area of an image being viewed, whether it’s the entire original source at a low resolution, or a small area that has been expanded to full resolution. Multiband histograms can be used to enhance the color stretch and contrast of the currently viewed area, and can be reapplied to other areas of an image or to different images. Applying the default contrast stretch repeatedly on an image while zooming, provides a quick way to enhance the current area being viewed without having all the statistics and data mapping tools taking up screen space. HiView can save the area of an image currently displayed as a TIFF, JPEG, PNG or other format for use in different image editing applications for further enhancement of any particular region of interest at full resolution. Note: Install software at your own risk. HiRISE and the University of Arizona are not liable for any issues arising from the use of the HiRISE website or any downloadable software.